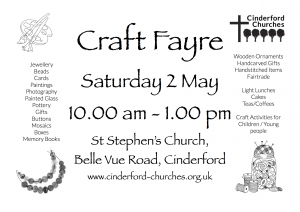 St Stephen’s (Belle Vue Road, Cinderford in the Forest of Dean) will be hosting a Craft Fayre displaying the work of many talented local artisans on Saturday 2 May from 10.00 am until 1.00 pm. Light lunches along with Fairtrade teas and coffees will be served and there will be a cake stall with a range of delicious treats. 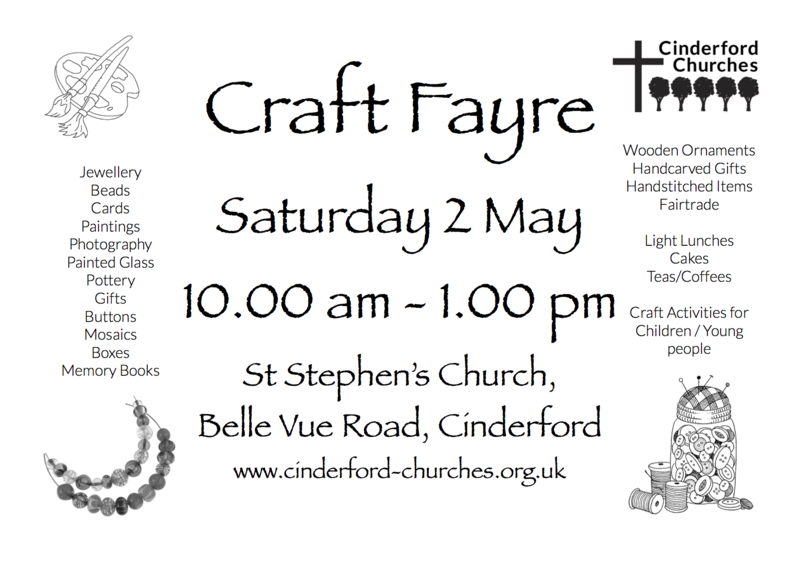 Craft activities will be available for children and young people to participate in during the event. Stalls already confirmed cover a wide range of products including paintings (from Sian at HeARTreach), Jewellery (from Lynne at Lynden Jewels, Carol at Jewels of the Forest), Pottery (from Lou at Kadkatan Pottery), Wooden candle holders, crafts and ornaments (from Lynne and Liz at LMR Crafts), Photographic prints, cards and calendars (David Tinsley Photography) along with a variety of gifts, buttons, mosaics, memory books, beaded bookmarks, handstitched items (aprons, pan holders, tablemats, etc) and much much more! Entry to the event is free, please do come along and appreciate the talents of so many local artists, it is an excellent opportunity to purchase some unique gifts or beautiful items for your own home! There is currently no spaces available for tables (which are £5 each), please email Rachel at [email protected] to check on last minute availability due to cancellations.